Floris Books of Edinburgh, Scotland, is the main publishers of Anthroposophical literature in the English language. Anthroposophy was founded in 1913 by former Roman- Catholic Rudolf Steiner from Austria (1861 - 1925), pedagogue and philosopher. Anthroposophy is a world view which sees the cosmos integrated in a gradual evolution, which man has to accomplish by sympathetic understanding and recognition in order to reach higher "spiritual" experience and to gain supernatural capabilities. It mainly draws ideas from Johann W. Goethe; furthermore it is influenced by Christian, Hindu, gnostic and neo- kabbalistic thought. Anthroposophical ideas also exercise strong influence on the education of children in the so- called Waldorf Kindergardens and Schools spread all over the German speaking countries, founded by the Anthroposophische Gesellschaft (Society) in 1919. The "Christian Community" within the Anthroposophical movement has to be distinguished from the Christian mainstream. It's teachings and ideology are based on "Theosophy"; the grave differences are the conception of the substance or, entity of the Godhead, the lives of the Jesus- boys (pl.) and the evolution of the Christ, the migration of souls and the incarnation of biblical figures, to name just a few. These substantial differences aren't necessarily evident from a mere reading of the biblical texts, but lie beneath the surface of the plain wording. The rendering of the Scriptures within the theosophical conception is very powerful, carefully done, and has kind of a cosmic dimension. Beyond criticism is the quality of the books regarding to their binding and printing. Other than in the German language, these are only New Testament texts known to have been translated into English. Numerous titles, NT and OT parts have been published in German since the 1920s. The Gospel of John seems to have a special attraction to the Christian Community Theosophians. 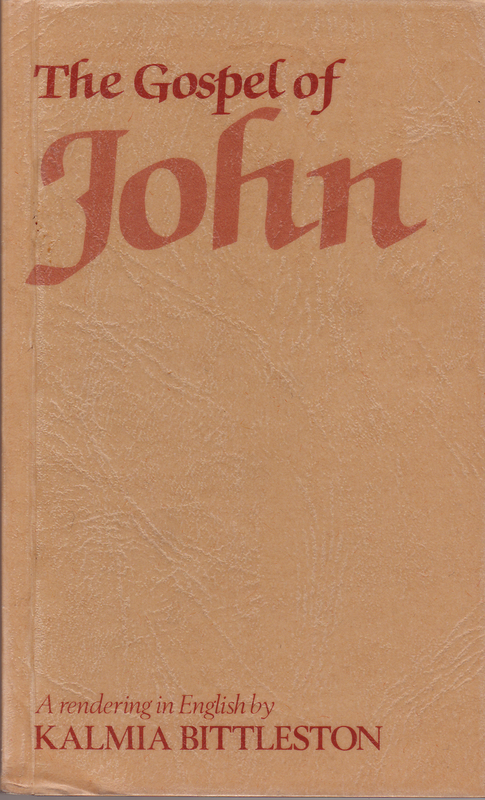 The only known complete New Testament in English is by Jon Madsen; linguistically it is based on the German New Testament done by Emil Bock (from 1930 on and later). Kalmia Bittleston (1909 - 1989) served as a priestess in South Africa. Stanley Drake (1906 - 1986) also was a priest within the Christian Community. According to the definition of Anthroposophy, the Greek noun ἄνθρωπος, Man or, Human, is a combination of ἄντι, opposite, and τρόπος, turning, i.e. the one turning (opposite) upward, the "human". 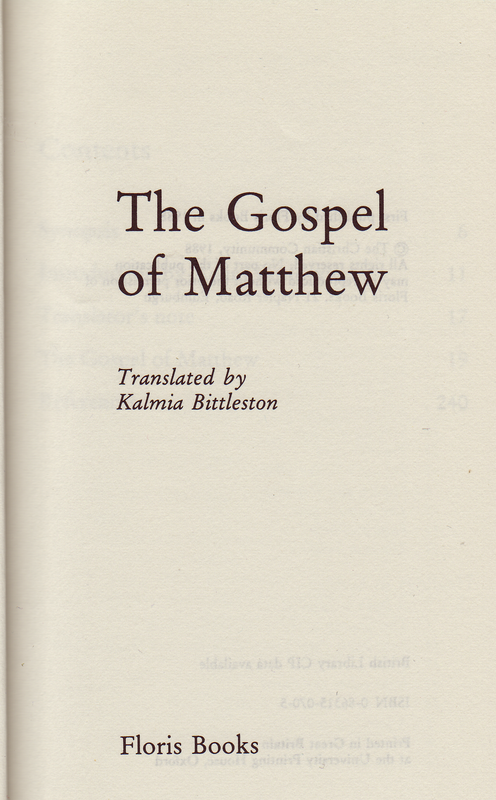 Contents: Gospel of Matthew, introduced by Adam Bittleston with a Translator‘s Note. OT References at the end of book. Comments: Paperback in small octavo with 240 pp. 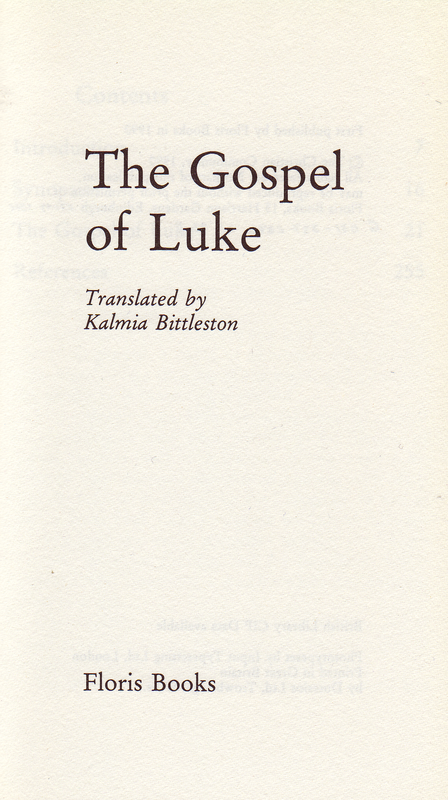 Adam Bittleston (1911-1989) wrote a multi page Introduction to the Gospel. Kalmia Bittleston authored the Translator‘s Note. 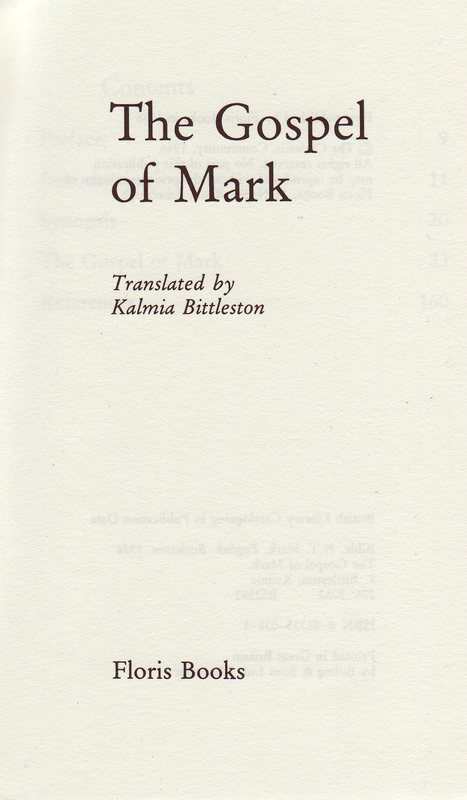 The translation itself, taken from the (unspecified) Greek, is printed in colometric verse which makes it perfect for reading aloud. At the end of the book one finds a collection of references to the OT. 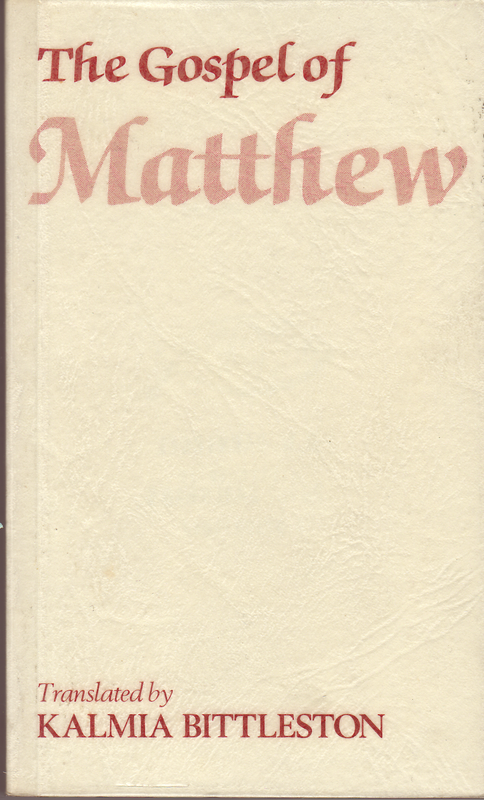 Contents: Gospel of Matthew, introduced by Michael Tapp and with a Preface by the Translator. OT References at the end of book. Comments: Paperback in small octavo with 160 pp. 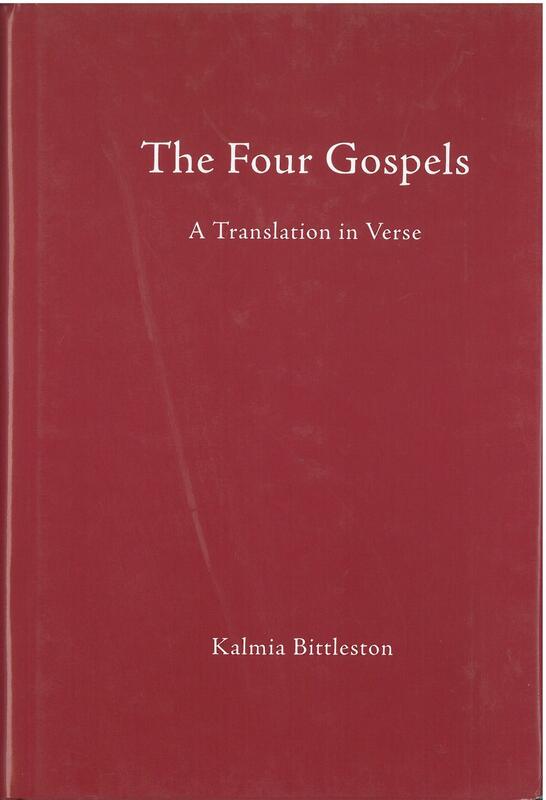 Kalmia Bittleston authored the undated Preface; Michael Tapp wrote a multi page Introduction to the Gospel. The translation itself, taken from the (unspecified) Greek, is printed in colometric verse which makes it perfect for reading aloud. At the end of the book one finds a collection of references to the OT. 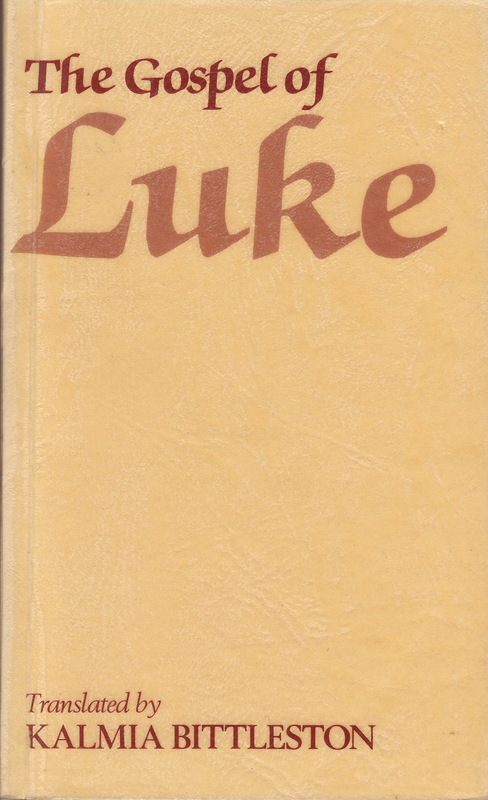 Contents: Gospel of Luke, introduced by Adam Bittelston. OT References at the end of book. Comments: Paperback in small octavo with 256 pp. 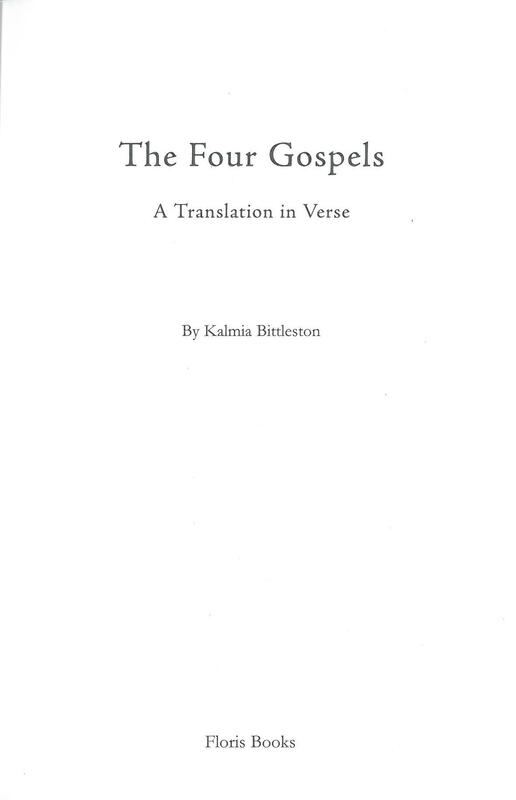 Adam Bittelston wrote a multi- page Introduction to the Gospel. The translation itself, taken from the (unspecified) Greek, is printed in colometric verse which makes it perfect for reading aloud. At the end of the book one finds references to the OT. Contents: Gospel of John, with Introduction. OT References at the end of book. 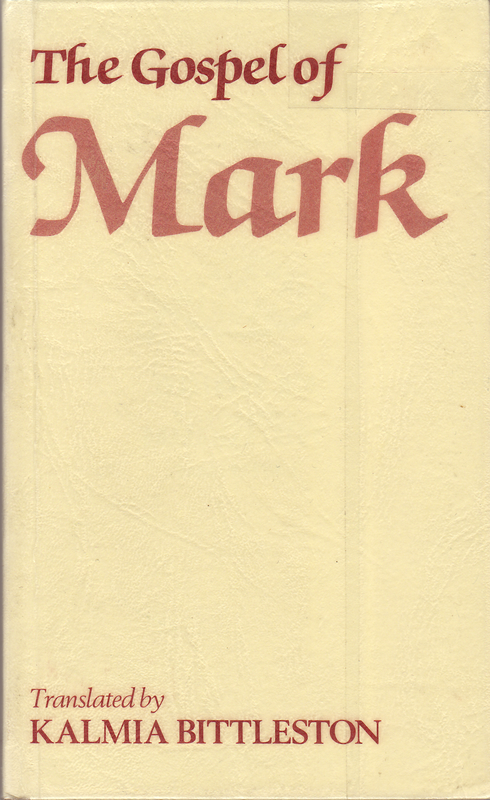 Comments: Paperback in small octavo with 190 pp. A multi page Introduction precedes the Gospels. The translation itself, taken from the (unspecified) Greek, is printed in colometric verse which makes it perfect for reading aloud. At the end of the book one finds references to the OT. 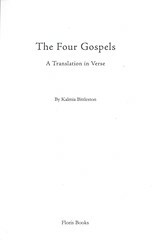 Title: The Four Gospels. A Translation in Verse. By Kalmia Bittleston. 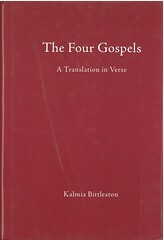 Contents: "An alternative translation in lyrical verse of the Gospels of Matthew, Mark, Luke and John". 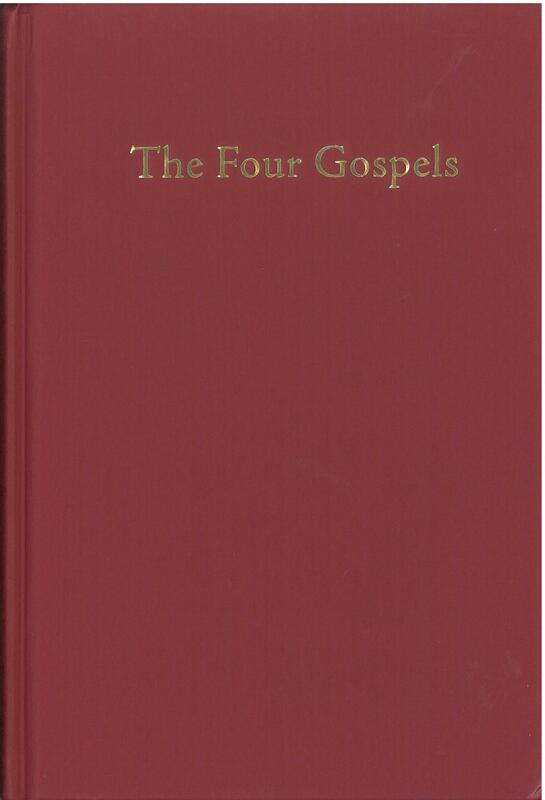 Comments: The one volume edition of the Four Gospels combines the above four publications into a single volume. Some minor editing was done to the text by Arie Boogert. 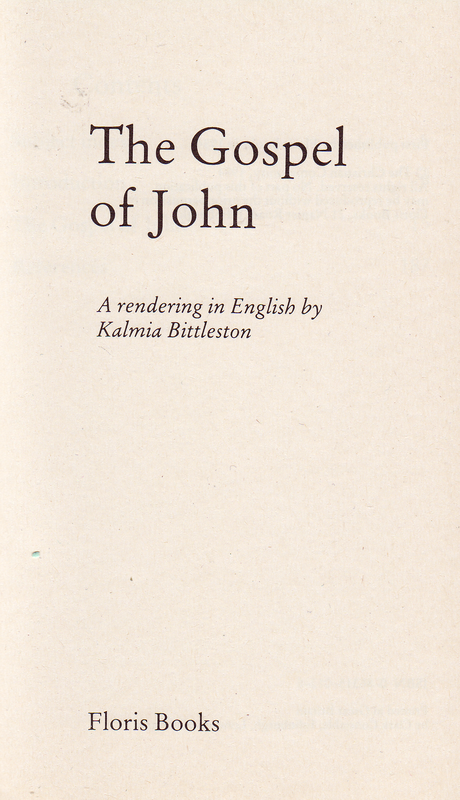 Kalmia Bittleston's original Preface and Translator's notes were abridged and combined into a single Preface. Adam Bittleston's two Gospel Introductions are retained as is Michael Tapp's Introduction to Mark. Octavo 588 pp. 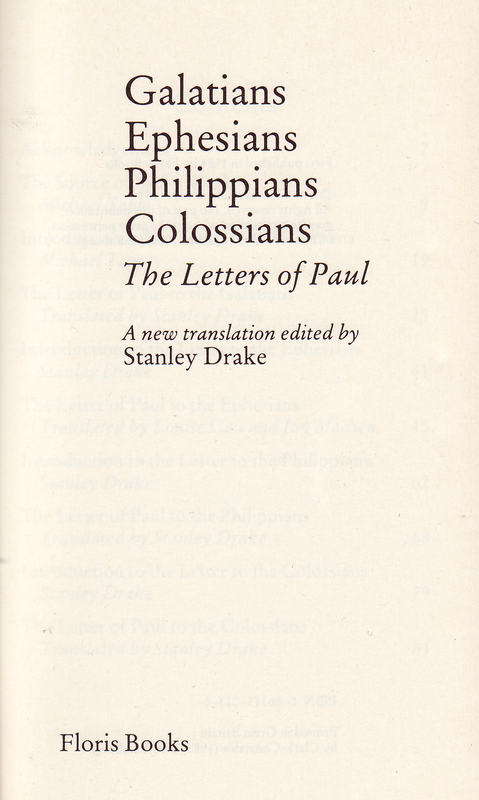 Contents: The Letters of Paul to the Galatians ✳ Ephesians ✳ Philippians and Colossians with respective introductions written by Michael Tapp and Stanley Drake. 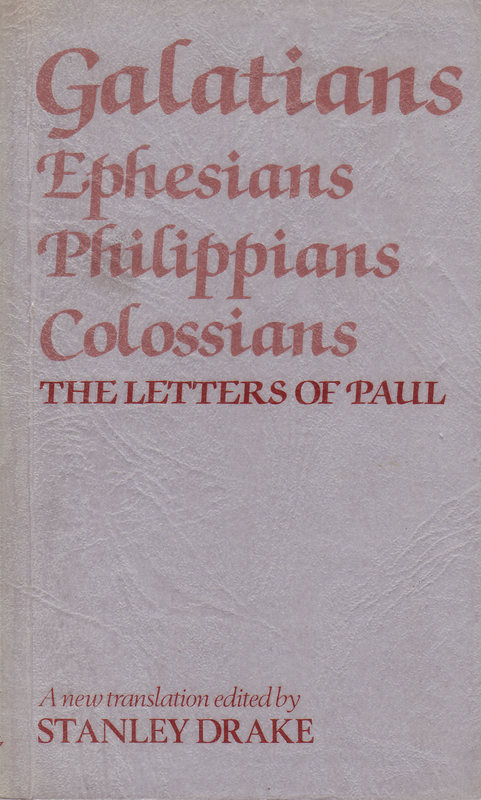 Louise Cains & Jon Madsen translated the Letter to the Ephesians. Comments: Paperback in small octavo with 96 pp. The Translators, so to be read in the »Acknowledgement«, are indebted to the late Emil Bock, who translated the New Testament into the German language and whose theological knowledge has been used. Michael Tapp wrote an essay about »The Source of Paul‘s Work«.